Luchi is purely a Bengali cuisine mainly made in Durga Puja, Jamai Sasthi or any other Bengali festivals. In fact, without any festival Bengali people love to have Luchi with Cholar dal or Aloor Dum in morning as breakfast. 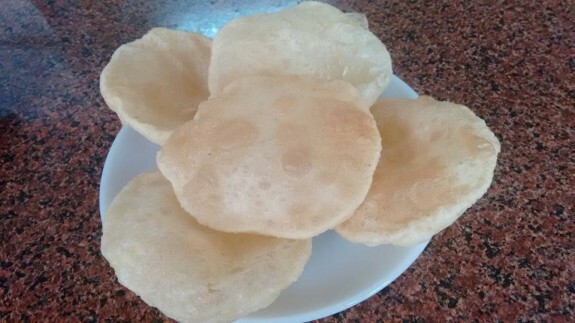 In North India, it is also called as pooris, however, luchi is much softer than pooris and not browned in colour like pooris. It is a light cream with white in colour with soft puff up. 1. Take a bottom depth big bowl and add flour, salt and sugar. Mix everything well. You can skip the sugar if you don’t want to add sweet. 2. Now, add oil and mix it very well with your hands. 3. Add about ½ cup of water and start to knead the flour. 4. If you need more water, you can add as you have to knead very well and the dough should be soft and smooth. 5. Cover the dough with moist kitchen towel for about 15-20 mins at room temperature. 6. Now make small size balls from the dough. 7. Apply little oil on the balls and roll each ball as a round circle of about 3-4 inches. 8. Heat oil in a kadai or pan. Oil needs to be hot. 9. Gently drop the dough circle one a time in the hot oil. Now the luchi will begin to puff up. 10. Check whether the luchi is completely puffing or not. Otherwise gently nudge with a spoon to help the luchi complete puff up. 11. When one side is ready and become light cream, turns over and fries the other side. 12. Remove the luchi and drain it on kitchen towels for extra oil to be soaked. 13. Serve the luchi hot with aloor dum or cholar dal.